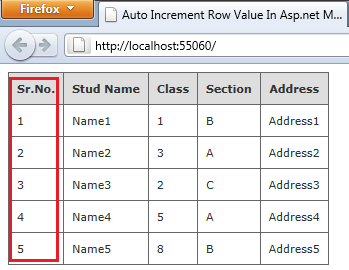 This article will show you how you can add auto generated row number in an asp.net mvc webgrid. This article you can use in MVC2, MVC3, MVC4, MVC5 webgrid. 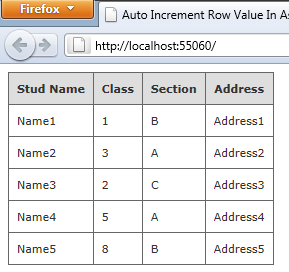 This will also cover for dynamically add row number in mvc webgrid. Some of my previous articles are as follows: Code to Dynamically Bind Image To Asp.net MVC WebGrid, Display User Detail Using jQuery ToolTip In Asp.Net MVC WebGrid, How To Disable Sorting in Asp.net MVC Webgrid, MVC WebGrid Custom paging With Page no and Shorting Data Using C#.Net, Frozen Rows and Columns in Asp.Net Mvc Webgrid Using jQuery Like Excel Sheet, How to Bind Data to Webgrid in ASP.net MVC Using C#.Net. In this we will add a dynamic row number in below shown webgrid. After adding model class file we will add a controller in our project. After adding controller we will create view for this controller action. Here in above code I have added some value to student list to display in webgrid. In above please check the grid.Column("Sr.No. ", format: item => rowVal = rowVal + 1) line of code. In this I first I have declared a integer variable and then added to the webgrid column incremented by 1. This will responsible for creating dynamic now number. Now run the application to check the output. It works perfect if there is only one page ,but when multiple pages are there it starts indexing form 1 in next page.which should't happen.